I’m sure you’ve heard of the many benefits of drinking coconut water by now. It’s great for building up the immune system and making you more resistant to getting sick as well as fighting off bacteria. It also helps build healthy bones and teeth and Coconut’s are also a great source of fiber, antioxidants, vitamins, minerals, and amino acids. It contains a good dose of calcium, natural electrolytes (like you find in sports drinks to keep you hydrated), and it contains potassium and magnesium too. Coconuts are great for providing a quick source of energy, improving athletic performance and it improves digestion too. It restores and promotes healthy thyroid function, improves insulin secretion, regulates hormones, helps protect against kidney and bladder infections, improves good cholesterol levels and provides increased heart health, promotes weight loss by boosting metabolism and reducing cravings for sweets, can improve memory, and helps keep hair and skin looking younger too! In fact it actually works to ward off wrinkles, so it has some pretty sweet beauty benefits too! But did you know that you can take Coconut Water to the next level to help you get more out of your workouts? Detach Coconut Water is coconut water evolved. It’s a true superfood that goes beyond traditional coconut water by adding purified sea salt to an organic coconut water base for better hydration! So you’re going to get a much better-hydrated workout in while drinking Detach Coconut water! No more super sugary sports drinks! Detach coconut water is the healthy, natural and organic alternative to helping you stay super hydrated while exercising! 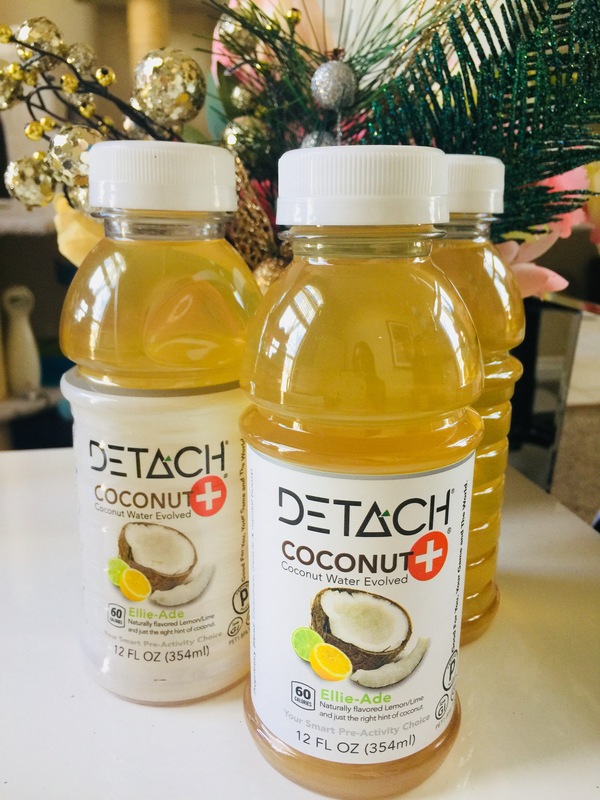 Detach Coconut Water also contains nectar and wildflower honey for a low glycemic energy boost! You will also find a fabulous proprietary blend of protein building blocks in these yummy, super nutritious coconut waters, such as Beta-Alanine – which has been scientifically shown to improve performance times at intensity! It also contains Citruline, whhich is known to improve cardiovascual capacity and function, and Theanine (commonly found in green tea) which has been shown to enhance mood and improve focus! The refreshing citrus lemon-lime with a hint of coconut flavor not only helps boost your hydration and performance while exercising, but it also will help improve mood and focus too! Who knew a coconut water could do all that?! It’s also low in sugar, doesn’t contain any artificial sweeteners, and is only 60 calories per bottle which I specifically love – along with the taste of course (Which has actually been voted #1 by non-coconut water consumers!) So even the non-coconut water drinkers love this stuff! Detach Coconut Water truly goes beyond hydration…. It’s great for drinking pre-workout and/or to drink during your workout, especially while doing those super fat-burning workouts such as running, cycling, or swimming! It’s gluten-free, Paleo certified, Low-Glycemic, organic, and uses non-GMO locally sourced ingredients! It’s a drink to help you feel your best and reach your personal best! Hitting the gym after work has never been easier with The Work Edit collection from MPG Sport. By incorporating their signature technical construction with everyday fabrics, MPG has created a collection that is both office and gym-ready, without giving the secret away. Plus, save up to 76% on select styles and get free standard ground US shipping on all orders over $99. Valid through 1/14/18. Here are a few of my favorite pieces from the collection. This stylish performance silk tank is both chic and durable. Pair with a blazer by day and wear it solo at night for your favorite hot yoga class. Sporty-chic and functional, dress this jersey top up with a long belted jacket or dress it down for a studio workout. Either way, this long sleeve top with a built-in bra is a versatile must-have this season. Cover up on chillier days with this super soft, silk blend sweater. Professional enough to wear in the office but comfy enough for the gym, this sweater is meant to be lived in. Don’t forget to follow MyStyleSpot on Facebook and Twitter to stay up to date on all things fashion and fitness!